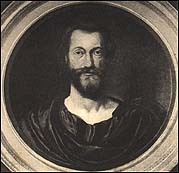 John Donne. "Songs and Sonnets." This HTML e-text of John Donne's "Songs and Sonnets" was created in January 2000 by Anniina Jokinen of Luminarium. The unaltered text is from The Muses' Library edition, edited by E. K. Chambers, 1896. Chambers' text is based on the 1633, 1635, 1650 and 1669 editions of Donne's Poems the current editor has omitted the variorum and notes, for which the reader is encouraged to see the source text, or any of the excellent modern works on the subject. Donne, John. "Songs and Sonnets." Poems of John Donne. Vol I.
E. K. Chambers, Editor. London: Lawrence & Bullen, 1896. 1-82. To-morrow when thou leavest, what wilt thou say ? Wilt thou then antedate some new-made vow ? We are not just those persons which we were ? Of Love, and his wrath, any may forswear ? Bind but till sleep, death's image, them unloose ? Can have no way but falsehood to be true ? To cut it, can find none. Alas ! alas ! who's injured by my love? What merchant's ships have my sighs drown'd? Who says my tears have overflow'd his ground? And we in us find th' eagle and the dove. A pattern of your love." Itself o'er us to advance. Are but turn'd aside to sleep. Mine own executor, and legacy. It seem'd, and therefore for our loss be sad. But O ! no man could hold it, for 'twas thine. When thou and I first one another saw. But now no more than all the rest. Can be such kings, nor of such subjects be. To write threescore ; this is the second of our reign. A VALEDICTION OF MY NAME, IN THE WINDOW. And clear reflects thee to thine eye. Here you see me, and I am you. Who have the pattern with you still. Which tile this house, will come again. When these stars have supremacy. No door 'gainst this name's influence shut. Since I die daily, daily mourn. In it offend'st my Genius. And unaware to me shalt write. Receive such balms as else cure every thing. Or a stone fountain weeping out my year. For all are false, that taste not just like mine. Than by her shadow what she wears. Who's therefore true, because her truth kills me. And to all eyes itself betrays. So they deserve nor blame, nor praise. My love was infinite, if spring make it more. From love's awakened root do bud out now. No winter shall abate this spring�s increase. Would for a given soul give something too. But am, alas ! by being lowly, lower. Except that he Love's minion were. A tender shame make me mine own new woe. Having put Love at last to show this face. Mines in the earth, than quarries were before. Rack'd carcasses make ill anatomies. And by this mintage they are something worth. This world, by waters sent from thee, my heaven dissolvèd so. Whoe'er sighs most is cruellest, and hastes the other's death. Say, where his centric happiness doth lie. I should not find that hidden mystery. But get a winter-seeming summer's night. With fear of missing, shame of getting, torn. And equal traitors be she and his sense. And at the last be circumcised for bread. Nature beforehand hath out-cursèd me. Of absence, darkness, deaththings which are not. Alas ! is wiser far than I. Were gone outhung 'twixt her and me. Small change when we're to bodies gone. Who died before the god of love was born. Sunk so low as to love one which did scorn. I must love her that loves not me. Nor he in his young godhead practised it. Love, till I love her, who loves me. His vast prerogative as far as Jove. All is the purlieu of the god of love. I should love her, who loves not me. As though I felt the worst that love could do? Which, since she loves before, I'm loth to see. If she whom I love, should love me. 'Twas neither very sound, nor meant to me. For eyes, which roll towards all, weep not, but sweat. To be the fortieth name in an entail?" At what, and when, and how, and where I choose. And the game kill'd, or lost, go talk or sleep. That I should give to none, but such as had too much before. Only to give to such as have an incapacity. Only to give to those that count my gifts indignity. Taught'st me to make, as though I gave, when I do but restore. For younger lovers, dost my gifts thus disproportion. The world by dying, because love dies too. To invent, and practise this one way, to annihilate all three. That since you would have none of me, I bury some of you. Alas ! if you must go, what's that to me? Than if I had stay'd still with her and thee. UPON THE HILL, ON WHICH IT IS SITUATE. But must or more or less than woman be. My heart to study her, and not to love. She were by art, than nature falsified. First into five, women may take us all. Naked you have odds enough of any man. She, to my loss, doth by her death repair. A latter bullet may o'ertake, the powder being more. Nothing more endless, nothing sooner broke? "I'm cheap, and nought but fashion ; fling me away." She that, O ! broke her faith, would soon break thee. Than virtue, or the mind to admire. If I know yet what I would have. Though I speed not, I cannot miss. Any so cheap a death as saying, "Go." Ease me with death, by bidding me go too. And a just office on a murderer do. Being double dead, going, and bidding, "Go." Am, by being dead, immortal ; can ghosts die ? Leaves behind, two hours after. Love-slain, lo ! here I die. Our bodies, not we move. To tie us to that way? O give no way to grief, &c.
As ignorantly did I crave. As they wax lesser, fall, as they size, grow. A kind of sorrowing dulness to the mind. Eager, desires to raise posterity. Though I admire their greatness, shun their heat. 'Tis but applying worm-seed to the tail. A LECTURE UPON THE SHADOW. Along with us, which we ourselves produced. From us and our cares ; but now 'tis not so. But O ! love's day is short, if love decay. And his short minute, after noon, is night. And so is mine ; so should yours be. Ascaused by themI love my smart. Unless self-love take private end. That to Love's self for love's own sake? May show his patience, not his love. Which never should to public tend? That in my passions I may hope the best. Within the writings which thou hast address'd. But swear thou think'st I love thee, and no more. ©1999-2007 Anniina Jokinen. All Rights Reserved.